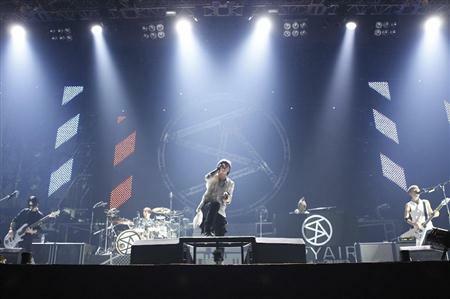 On December 18th, 5-member rock band SPYAIR held their first live concert at the Nippon Budokan. This became SPYAIR's last stage with the 5 members, since the band's �DJ, ENZEL? left the group�with this live concert. They performed a total of 21 songs including their latest single "WENDY~It's You~" (released on November 21st), and attracted an audience of 10,000. On the stage, ENZEL?�shouted, "I am so proud that I was able to stand on this stage with these�members. Thank you to all of you!" It's said that ENZEL? will set off on a journey after this, so the fellow members gave him a backpack as a gift. There is also happy news. It was announced on SPYAIR's official site that their first single for 2013 titled "Sakura Mitsutsuki" is set for release on March 13th! It has already been chosen as the opening theme song for TV Tokyo's ongoing anime "Gintama" for the month of January. The single will be released in two versions; [CD+DVD], and [CD Only]. They will reveal more details on the single later on, so stay tuned!